The history of the Turkmen responsible for the weavings illustrated in this catalog has never been easy to understand. Most references to their origins are based on the same hypothesis that begins with the migration of nomads from southern Siberia who brought with them the art of cut-pile weaving. While it is true that the oldest known knotted-pile weaving has been found in this general area, the following text will show that the prehistoric occupation of south-west Turkestan by indigenous groups of inhabitants must be considered before conceding that the much later migration of Siberian nomad groups was the only source for the Turkmen lifestyle and weaving tradition. The long and indigenous cultural history of Turkmenistan, which began well before migrations of mounted nomads from the northern steppe during the eighth century BC, should become quite obvious after reading the next part of this text which will begin to explain the archaeological history of this area. These developments were relatively recent happenings as sites in the north-eastern Caspian can be dated as early as 10,000 BC and the first settlements in the Kopet Dagh piedmont of south-west Turkestan occur c.5800BC. The continuous occupation from roughly 6,000 BC clearly formulated a broadly based cultural dynamic on which the Turkmen lifestyle was established. The related prehistory of the adjacent areas of Iran, the Caucasus and the more distant and earlier cultures of Anatolia and the Levant have not been detailed as they fall outside the scope of this exhibition. However, influential developments in these areas will sometimes be mentioned and it should not be overlooked that the incipient settlements of south-western Turkestan must not be considered as separate from the developing cultural evolution that occurred within the entire area of the Middle East. The tenacious quality of culture and tradition to remain fixed to geographical location is another factor that should not be forgotten in considering the history of the Turkmen. The societal changes that began in this area during the sixth millennium BC established important cultural fundamentals that were able to remain unchanged in the face of great social unrest and pressure. These intrinsic patterns in settlement location, architectural techniques, agricultural methods, animal husbandry and design traditions have survived virtually unchanged for thousands of years. They provide the real history of the Turkmen. The origins of the inhabitants who created the first settlements during the Neolithic period in south-west Turkestan have not been conclusively determined. Yet it is highly probable the earliest inhabitants were in fact introduced to this area during great west to east migration which occurred during the Paleolithic period. This would imply their being indigenous to this area for a long time before the end of the sixth millennium BC. Similarities of material culture and technology evident in the archaeological record, during what is known as the Jeitun phase, directly support this theory. As settlements, locations and their associated increases in population continued to grow over the next 3000 years, the success of early agricultural methods and animal domestication become quite apparent. It has been suggested that these techniques were introduced here by the migration of foreign and more highly sophisticated groups of settlers from the west and south. Surprisingly, at the beginning of the third millennium BC, the two largest and most developed urban centers of south-west Turkestan were abandoned and it was only in the south-eastern area of the Murghab river plain that cultural and technological advance continued. During this early period, there is no evidence of substantial contact with the groups from the north and it was not until much later that the presence of northern steep nomads became prevalent. After 1000 BC, such contact can be well documented and the history of successive conquests of south-west Turkestan was begun. However these military and politically determined changes had little real effect on a basic culture and tradition which had been developing throughout the previous 5,000 years. The previously mentioned abandonment of the large settlements in the Kopet Dagh during the third millennium BC was known to have been followed by the expansion of settlements further south and east. It is also possible some groups remained and reverted back to the earlier nomadic lifestyles practiced by former generations. These groups could have continued living in these areas in relative isolation and, if so, may have provided another source of the post tenth century AD Turkmen tribal lifestyle and society. Some archeological support for this idea does exist and it will be referred to later. Needless to say, the complete picture of this long and complex history has yet to emerge and consequently the origins of the Turkmen, interwoven with as yet unknown and other only partially understood events, remains as enigmatic as the designs used on the weavings themselves. When the first groups of migrants came into this area it is believed that they already were herding goats. Indications for early domestication have been documented in level 4 of Dam Dam Chesme, c.7000BC, a cave site located in the area of the north-east Caspian. Still primarily hunters, fisherman and gatherers the inhabitants were living a continuation of the Paleolithic lifestyle that has been documented by the discoveries of many open-air occupation sites located east of the Kopet Dagh, from Bukhara to the modern Chinese border. These sites, often located in caves, were inhabited only part of the year and at others times temporary round or oval shaped dwellings of post-hole construction were known to have been used. These findings are similar to the far greater number of traces from the foundations of similar primitive yurt-like structures, which have been associated with other pre-Neolithic tribal groups located throughout the entire neighboring Near Eastern region. Sometime c.6000BC settlements with square buildings of early mud brick construction were begun and numerous early villages of this type have been archaeologically documented on the piedmont of the Kopet Dagh. Most probably groups of nomads were also still living in the higher elevations of these mountain areas and on the western fringes near the Caspian. The progressive enlargement and the eventual depopulation of this area detailed in the next part shows once again the possibility for some groups remaining in this area and forming the small village settlements associated with the Late Bronze Age. These shifts in settlement patterns provided convenient cultural alternatives and the three modes of existence - nomad, pastoralist and settled agriculturalist have been adopted both in ancient and modern times in response to conditions imposed both by both environmental and political variables. There are basically two forms of nomadism, the first based on hunting and gathering and the second on domesticated animal herding. Nomads would not wander aimlessly, they would return whenever possible to known locations where environmental conditions provided good hunting or pasturage for their animals and/or the possible harvest of wild grains and other edibles. Pastoralists have a permanent site, usually a small village where each family unit had a house. Presently in some of these areas houses are still constructed using the same techniques of mud-brick construction that were used in prehistoric times. The archaeological record demonstrates some agriculture was practiced around many of village sites in south-west Turkestan but it was domesticated animal herding that provided the major food source. During the summer time in many of these areas, climatic conditions required seasonal movement from villages located on the low, hot open plains to cooler higher elevations. These locations were revisited year after year and when living there a yurt was set-up and used. This practice is still followed today and even in villages where no seasonal migration takes place many times a summer yurt is still set-up next to the poorly ventilated mud-brick houses and used until cooler weather returns. Settled agriculture required land capable of supporting large scale irrigation and as most areas of south-west Turkestan were unsuitable it was only in the delta plains of the Tedjen, Murghab, Amu Darya and Zeravshan rivers that villages and cities with economic systems based on such agricultural techniques were possible. Some of these villages, it seems, became important trading centers because of the excess agricultural products they produced. A few were even able to develop into highly advanced trading and manufacturing capitals where various workshops produced technologically sophisticated goods that were traded to the surrounding villagers and nomadic tribes in exchange for animals, game and raw materials. The modern towns of Bukhara and Merv are located on two of these sites. Dissication and drought, often due to climate and river course changes, forced the gradual abandonment of the large settlements in the Tedjen and Murghab areas. This was not the case in both the oases of Merv and Bukhara, which were situated on far more hydraulically stable formations. In the former two areas most inhabitants moved and established new settlements but it is entirely possible that some groups reverted back to nomadic and/or pastoral lifestyles to repopulate other more hospitable areas of the Kopet Dagh piedmont. By the first millennium BC, the nomads and pastoralists living in the foothills and plains of south-west Turkestan formed an indigenous population. They still utilized the same type of dwellings and locations that had been used for generations. They depended on the same animals and agricultural systems for sustenance and seemingly they retained the same ancient religious and cultural beliefs. Many successive waves of foreign conquest began at this time and ended with the final Turkicization. But these political and military changes were only able to wash over the top of a powerful traditional culture whose ultimate relevance to these inhabitants enabled it, like a ball hit by a giant wave, to continually pop back up to the surface virtually unchanged and still potent. Before the Islamic conquest beginning during the eighth century AD the only changes caused by these incursions were political and at best they were generally limited to the large oases areas of concentrated population and wealth. While in the outlying mountains, foothills and plains few or hardly any changes at all were experienced. However, the introduction and constant assault of Islam fostered a gradual but constant formation of new social, political and cultural alterations in these areas that continued until the final Russian conquest during the mid-19th century. In many of these outlying areas, particularly in the east Caspian and the Kopet Dagh, most of the indigenous prehistoric cultural, social and political tradition eventually began to exhibit noticeable change. These developments were greatly influenced by the introduction of northern steepe horse culture as well as other foreign cultural alternatives, particularly those based on Islam. It was this process of amalgamation that eventually precipitated the settled Turkmen tribal system that was very different from the small groups of Turkmen who continued to live an archaic nomadic lifestyle. It was these nomads who produced the archaic period weavings illustrated in this exhibition. And it was examples like these that kept the ancient roots of the Turkmen weaving tradition alive. The prehistoric evolution of settlements, culture and technology in south-west Turkestan was directly inter-related in the larger picture formed by other Near Eastern developments and contacts. In the Levant and the Zagros Mountains of western Iran c.10,000BC the foundations of animal domestication were already being explored while the recognition of wild cereal grain harvesting and its preparation as food had already become featured in the lifestyle of these emerging population areas. There were as yet no permanent settlements, only small transient sites each probably inhabited by a group of blood relations. However, with the passage of time the number and size of these sites significantly increased. The first definitive indications of animal domestication in the Near East or for that matter anywhere else date from c. 7900BC and have been found in the nearby Zagros Mountains. At around the same time period the site of Muryebet II provides the first conclusive proof for the use of cultivated wild cereal grains as food. Archaeological evidence recovered here suggests this site could be called the first village. Still living in round huts, which were remarkably similar to yurts, these incipient herders and farmers played a key role in the development of civilization. In the successive layers of occupation at Muryebet III, the earliest recorded rectangular house, which would eventually become the standard dwelling shape, existed side-by-side with the older round form. Archaeological excavation has uncovered several examples of buildings with bull horns embedded in the walls and in one particularly unique building the appearance of the earliest existent painting on man-made walls was documented. This wall-painting of horizontally placed zigzags in black on a buff ground was found along with a dagger and stylized human head made of obsidian in a round building which possibly may have served as a shrine for cult practices. Female stone statues that do not yet approach naturalistic later forms have been recorded from neighboring sites in the Levant, while in the Zagros no such figurines have yet to be found. Very early evidence for weaving in the form of stone spindle-whorls used to spin animal hair fibers have been found farther south at the seventh millennium BC site of Tell Ramad I. The inhabitants of these early developing areas were Euroafrican and gracile proto-Mediterranean types whose burials were found inside the settlement areas under living-room floors or outside in separate cemeteries. The earliest recorded pottery has been found at Ganjdareh in the Zagros c. 7000 BC where square houses with niches containing rams horns have also been uncovered. Two naturalistic pottery female figurines have been found at the near-by site of Tepe Serab and spindle whorls were found in the lowest layers of the more northerly site of Jarmo c.6500 BC. At numerous other sites similar cultural advances and technological breakthroughs were made and the uneven stages of their progression demonstrate the same complicated relationships present in the prehistoric development of south-west Turkestan, where a similar continuous sequence of remains has established a long history of human occupation. The substantial and ongoing but as yet incomplete archaeological record established since the first Central Asian excavations of the 1880"s provides fundamental source material explaining the resultant Turkmen tribal lifestyle. The following is surely not meant to be an exhaustive study nor to provide the final word concerning the origin and stylistic development of Turkmen weaving but rather to introduce new perspectives increasing the possibilities for solving these intriguing questions. South-west Turkestan contains several mountain ranges that are set west to east and are called collectively the Kopet Dagh. Consisting of series of flat peaks no more than 3,000 meters high, they form the boundary of the important piedmont strip that was the site of many prehistoric settlements. To the north between the highlands of the Kopet Dagh and the vast Kara Kum desert lie fertile plains that have always been highly unstable and prone to massive earthquakes. Nearly 50 small rivers and many other streams flow down into this area and during ancient times provided the ample water supply necessary for dry farming, pre-irrigation in the foothills, and later simple irrigation agriculture. Unfortunately for the archaeologist, these water sources, irrigation systems and many occupation sites have been buried or destroyed by the constant alluviation and unstable geographic conditions. Due to this long term process of desiccation combined with river course changes many of these early agricultural settlements are now located in waterless, semi-desert zones. The largest and most important river, the Amu Darya whose ancient name is the Oxus, flows for or its volume and over the long northerly flow, it carries large 2540 Km from the Pamirs to the Aral Sea. Snow and glacier melt are the sources famounts of alluvial deposits. Consequently, the Amu Darya has been called the muddiest river in the world and this most probably accounts for the somber and less brilliant coloration apparent in the weavings of some tribal groups that used this water for dyeing. Today it forms a large delta south of the Aral Sea but during the Neolithic and Bronze Age ancient written sources and recent archaeological findings have confirmed theories of a continued flow further west, ending at the shores of the Caspian Sea. Other major rivers of this area are the Atrek and Gorgan which meet to form the archaeological important Gorgan Plain as they flow through northeastern Iran into the Caspian; the Zeravshan and Kashkadarya which join the Amu Darya and long ago formed a large delta plain and the Zeravshan which made an east-west valley corridor that today contains the city of Bukhara. From the slopes of the Hindu Kush mountains come several other rivers that form the southern Bactrian plain, which was known to have been extensively settled in ancient times prior to the beginnings of modern tribal occupation. Because the area of south-west Turkestan is so vast and has three distinct major zones of prehistoric settlement, it is difficult to generalize about the entire area as a whole and each must be examined individually. The piedmont of the north Kopet Dagh, the first area where agriculture was attempted, has many known archaeological sites. The many streams flowing off the mountains provided a stable water supply and the good existing climatic conditions made this area ideal for attempts at farming and for the pasturage of early domesticates. The Kopet Dagh, Gorgan, Bactrian and Amu Daryan plains, the second zone, were extremely fertile when supplied with sufficient water and had climates very conducive for agriculture. The associated tributaries of these river plains were easily contained and soon thereafter simple irrigation canals were established to stabilize the seasonal changes of water flow. Lastly, the Tedjen and Murghab delta areas have recently yielded archaeological information about early settlements and the important changes associated with the progression of Bronze Age cultures when large scale sophisticated irrigation agriculture was first successfully practiced. It is essential to remember that the significant differences in settlement patterns in these zones, as shown by archaeological investigation, reflected the varieties of site topography and technological sophistication. Several other factors should mentioned before continuing to describe the prehistory of south-west Turkestan. Naturally occurring wheat and barley were known to have existed along the Kopet Dagh piedmont and early settlement patterns were encouraged near the location of these fields, which were at first exploited for their seasonal harvest and somewhat later provided the stimulus for attempts at incipient cultivation. When combined with animal domestication, the resultant ability to control food supply led directly to increased population growth and the development of other technological advances. These changes, which hallmark the Neolithic period, occurred here quite late when compared with other areas. And while it was possible that the inhabitants of south-west Turkestan developed their own forms it is more likely that these progressions were associated with cultural migration from areas west and south, which were already acquainted with these advanced techniques. In comparison, Turkestan was always on the periphery of major societal evolution and as such never attained the sophistication and affluence of the Neolithic and Bronze Age settlements of Anatolia, the Levant and Iran. At times these other areas will be mentioned, as they have provided the source for many related cultural and technological advances. The complete picture of the prehistory of Turkestan is far from complete and has been limited by the effects of the many environmentally destructive forces known to be present in this area. Namely the heavy alluvation in the desert areas, great wind erosion on the plains and water erosion in the piedmont and mountain valleys. These factors combined with the man-made disruptions from major construction projects undertaken by the Russian Government over the past 100 years and the reluctance of the Soviets to allow outside academic investigation have also compromised the archaeological record. However, enough data has emerged to enable important factual conclusions to be drawn. Numerous Paleolithic sites providing archaeologists with a well established history of early human activity from 200,000-15,000 BC have been found in the more eastern area between the Amu Darya River and the modern Chinese border. South-west Turkestan was uninhabited during this time and not until the Mesolithic that any sites were located west of the Amu Darya. Several cave sites c.10,500 BC have been found in the area just south of the Caspian Sea on the western end of the Gorgan plain and their archaeological remains show habitation by groups of hunters who were possibly beginning to make attempts at gazelle herding. These areas were deserted c.9000 BC and not re-inhabited until c.7500BC when the data indicates a change in food choices as sheep and goat now provided the majority of animal remains. The first sickle-blades, the prehistoric tool developed and used to harvest wild cereals and grains, are also documented in these sites. By the seventh millennium BC at Dam Dam Cheshme, located farther north and east, the remains of domesticated goats have been found but there was still no evidence of cereal or grain cultivation. From the archaeological evidence, these cave sites served as seasonal settlements but when and how often they were used has yet to be conclusively determined. Though incomplete, this sequence has provided a direct link with the more advanced and subsequent Jeitun culture. The beginnings of food domestication are first found in the archaeological record at the twenty sites from the Jeitun period. They are located on both sides of the Kopet Dagh with the highest concentration located on the northern slope in south-west Turkestan. The broad distribution of sites extended west to Shahrud on the Iranian plateau and east as far as the former Tedjen river delta. It is believed that this culture began c.7800BC, at the site of Yarim Tepe located on the Gorgan Plain and in common with all the other known related sites this was only a small, self-sufficient village. The Jeitun cultural sequence has been divided into three phases, early, middle and late on the basis of changes in pottery technique and decoration. The first period c.6200-5800BC was distinguished by handmade pottery with painted decoration of wavy lines, sickle blades used for the harvesting of cereals and grains, terracotta spindle whorls used for spinning fibers for weaving and bone scrapers used to prepare animal skins for clothing. The second c.5800-5400BC was characterized by new and more sophisticated pottery forms with designs of closely packed vertical lines and fewer scraping tools which could indicate an increase of textile production and decreased reliance on animal skins for clothing. At Pessedjik-depe, a site associated with this culture and period, which was located in the Geok-depe region, the lowest excavation level has revealed a large central structure containing the already mentioned wall-paintings and a naturalistic representation of a large feline. In the third phase c.5400-5000BC there was an absence of scrapping tools, pottery was decorated with naturalistic tree forms, the buildings were constructed with real mud-bricks, small bits of man-worked copper and the occurrence of bread wheat, an early domesticated grain were also present. Domesticated goats and sheep have been found in all the Jeitun period sites, but domesticated cattle do not appear until the end of the last period. It has been proposed that the antecedent influences to the Jeitun period came from a west to east movement of peoples and societal advancement. But until further connections are found between the Caspian sites mentioned above and possible contemporary sites in the more western parts of the Kopet Dagh piedmont, the exact beginnings of this culture will continue to remain undocumented. One other possibility is the analogy between the late Jeitun sites and the site of Sialk I in Central Iran. The parallels between these two sites include straight reaping knives, stone and baked clay counters, and certain elements of pottery decoration. It is quite possible that northern Iran and southern Turkmenia shared a common Djeitun culture that, alongside the Zagros culture, formed the Iraq-Iranian area of early farming cultures. Chronologically the next developmental period exhibited vastly superior technological advances in metallurgy, agricultural implements, architecture, distinctive thin-walled sand tempered pottery, and the presence non-indigenous semi-precious stones. All these factors indicate a widening of trading partners and areas. The high level of this sudden progress has been often questioned and outside interaction and influence was most probably responsible. Known as the Anau Culture c.5000-4800 BC, it followed a similar distribution pattern to the preceding Jeitun period, however, these subsequent sites exhibited a more sophisticated and planned character than was previously present, further supporting the idea of foreign influences. At one site in the serakhs sub-delta of the Tedjen River, the possibility of advanced irrigation techniques has been verified and now, in fact, a difference in technological development between the sites of the western piedmont and that farther east became evident. Of more interest was the greatly increased quantity of spindle-whorls found during this time at many sites supporting theories of increased spinning and weaving. The next sequence, Namazga was named after the largest known prehistoric site found on the Kopet Dagh and has been divided into five main periods, Namazga I-V. A brief outline of the major developments of each phase follows beginning with Namazga I c.4800-4000 BC. Like the Jeitun and Anau, numerous sites were scattered across the piedmont strip with settlements that now extend even farther east into the delta of the Tedjen and the difference of material remains between the western and eastern geographic areas begun during the Anau period continued. A significant find of this period has occurred Yassi-depe, a small village located due north of Namazga, where a central two room building with wooden columns and frequently overpainted geometric wall-paintings was found. At Dashlidji-depe, located to the north, pottery decorated with chevrons and triangles of polychrome paint, a standing female figurine and zoomorphic figurines. "Weaving developed still further, as indicated by the large number of baked clay spindle-whorls..."(1) Domesticated sheep, goat and cattle provided the majority of animal food, although there was still evidence for hunting of gazelle, onager and wild mountain sheep. During this period, the archaeological remains suggest that an early form of class system was beginning to develop within the larger towns. Once again, further archaeological research will expand the documentation of the important cultural and technological changes that took place during the fifth millennium BC in this area. Of additional interest and importance is the continued occupation of the Tedjen river delta area that occurred during this time period. Thought to have been settled by surplus members of the larger sites in the western piedmont of the Kopet Dagh, this area provided different agricultural conditions with population centers developing along the river tributaries that had good water flow, particularly in the Geosykur Oasis. Throughout the next periods of development in this area population shifts followed the changes in the course of the river by moving to the south-west. During the next period c.3500-3000BC great changes in religion, politics and culture associated with the rise of civilization in Mesopotamia and elsewhere were brought to south-west Turkestan through increased trade and cultural contact. Presently only eleven sites, concentrated in the eastern and central zones, have been found and it is thought centralization into larger cities was further accelerated as many smaller villages were deserted. The appearance of large self-sufficient multi-roomed dwellings, each with its own area for pottery production and cult activities, provides ample evidence for a shift in societal organization while maintaining the continuance of many former cultural-religious traditions. Now the nuclear family structure of the earlier periods seems to have been replaced by an extended family arrangement, most probably determined by kin-related units. The introduction at Geoskyur I of collective burials seemingly organized along kinship lines further support these changes and have close parallels with contemporaneous sites located in the Caucasus. In some buildings at Kara-depe, which had approximately l000-l600 inhabitants during this period, circular altars that functioned as hearths have been excavated leading to the opinion that religious practices were carried out within each separate dwelling. Further proof of religious practices was revealed by the discovery of an interesting pottery fragment with "…two human figures flanking an anthropomorphic deity. "(4) Other types of female figurines have been found with well-modeled features that include complicated coiffures. Related male figurines have also been found at these sites but far less frequently. The occurrence of many conical spindle-whorls again implies the belief that extensive weaving technology was practiced at this time. The many different pottery styles, techniques and decoration imply the intrusion of newcomers into many areas during this period and are linked with the growth of the two large cities, Namazga-depe and Altyn-depe. These two sites characterize the next two phases of development and expansion. All indications point to south Turkestan being the northern outpost of the important cultural and technological advances made during the fourth millennium in the ancient Near East. In the Namazga IV or Early Bronze Age period c.3000-2500BC, two types of settlements were prevalent. The first was a new type characterized by larger proto-urban cities and the second was a continuance of the smaller villages known from previous times. Many sites had begun to adopt some of the technological and cultural advances that will be further developed during the coming somewhat short period of urban revolution in south-west Turkestan. More than twenty sites have been found and several related Gorgan Plain grey-ware sites show the existence of two distinct cultural complexes, grey-ware in the west and painted pottery which continued the styles of the previous periods in the central and eastern piedmont and also in the Tedjen delta. From the central Kopet Dagh site of Ak-depe several important findings imply those cultural traditions as coming from the west. The standing grey colored female figurines and the quantity of greyware ceramics found there and also at Parkhai II, located on the north of the Gorgan Plain, further support this conclusion. Also at Parkhai II the decomposed traces of a soft fabric or textile were found in one of the rectangular burial chambers along with two rectangular vessels decorated with bull heads. At Kara-depe similarities of ceremonial rites and the hand-made ceramics associated with Parkhai II have been found which further show the spread of western cultural traits into the central Kopet Dagh. The sites in the piedmont during this period reached their highest levels of occupation supported by refined methods of irrigation agriculture. Stock-breeding and craft-specialization also became firmly established with separate craft areas within the largest settlements now making an initial appearance. The major technological advances of this period, the introduction of the potter’s wheel and the two tiered kiln, were undoubtedly responsible for the resulting new pottery forms. 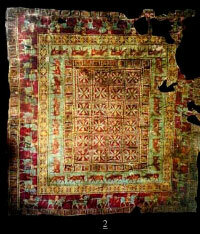 These were characterized by smaller and more intricate painted designs and have been labeled the carpet or tapestry style. At Altyn-depe, excavations have uncovered impressive fortified city walls and gates with wide streets, implying the use of wheeled vehicles, while at Namazga buildings with hearths set on podiums and stepped niches similar to the pyramid shaped pottery designs were also found. At many sites there was a continued development of the different pre-existing styles of female figurines with a new flat style with outspread arms making its appearance. The manufacture of oil lamps and other fine stone objects also became well established at this time. The two cities of the central Kopet Dagh, Namazga-depe and Altyn-depe functioned as centers for the surrounding villages, supplying services both technological and cultural that were unavailable at these smaller sites during the Namazga V or Middle Bronze Age developmental sequence c.2500-2200BC. The presence of monumental architecture, silver and bronze objects, and a high level of craft-specialization have encouraged archaeologists to label Altyn-depe and Namazga-depe as urban centers or cities and from their apparent size and population they surely must have been. At Altyn, three distinctly different residential areas; one for workmen and artisans; one for more wealthy citizens; and the third for the small number of elite showed a highly developed class system. Burials were both individual and collective, with grave goods that varied according to social rank and in one grave of the elite quarter a go"ld bull head encrusted with turquoise was found. Many house complexes had shrines or cult rooms, one particular example having a pyramid shaped niche. However in both workman and elite quarters, separate cult-buildings or temples were more likely to have been used. Female figurines of a now unified type and made of clay were frequently encountered, many with various incised designs and symbols. During the Namazga VI or Late Bronze Age c.2000-1500BC there was a marked decline in both population centers and material culture development in the Kopet Dagh. The formerly flourishing large cities of Namazga-depe and Altyn-depe were abandoned while in other areas east and south cultural progress was continued. There are only thirteen known sites associated with this sequence, five of which are cemeteries with the remainder being only small villages. The pottery found at these sites continued to be wheel-made and kiln fired, but its manufacture was far less refined and the shapes of the vessels became less varied and cruder. From the Sumbar tombs, located on the western edge of the piedmont strip came finds of crescent shaped knives made of bronze. These bear a remarkable similarity to knives still in use today for making carpets (cut-pile weavings) and they provide further evidence supporting the presence of this craft at this extremely early time period. At a contemporary cemetery located in the Geok-depe region wheel made grey ware was found along with female figurines of crude manufacture. Several other finds here have raised the possibility for contact with northern steppe peoples. North of Namazga, at the small site called Tekkem-depe, an assortment of burial goods containing incised ceramics, pots with potters marks and a polished stone mace head that was clearly related to northern steppe style, were also recovered. At other sites in the lower Murghab similar steppe-style ceramics were also discovered, further implying contact between these two areas. It would seem any contact at this time was rather limited in nature as the archaeological record clearly refutes any large-scale invasion by northerners. Certainly there was no collapse of civilization, nor any invasion to cause the desertion of Namazga and Altyn, but rather a shift of population slightly north and farther east into the lowland plains of Margiana (lower Murghab). Quite probably the gradual effects of man-made environmental disintegration on the ecology of the Kopet Dagh region could have stimulated this movement. Improvements in irrigation technology made it now possible to utilize the fresh land in the lower Murghab that previously could not support food production on any large scale. The incomplete picture presented from Late Bronze Age cultural data in Turkestan could radically change with the discovery of new sites in uninvestigated areas and/or new archaeological research in areas already partially explored. Since 1972, the discovery and study of over one hundred Bronze Age sites in Margiana, the delta region of the Murghab River, dramatically shows this possibility. Unlike the desert steppe that exists in this area today in ancient times agricultural conditions similar to the Nile valley are now known to have been the case. Formerly ignored, the discoveries made in this area have opened up new speculation on all later Bronze Age developments. Three chronological stages of occupation have been suggested and named after the central fortified oasis cities; Kelleli, Gonur, and Togo"lok. Many less fortified sites were clustered around each of these larger settlements. Most probably the inhabitants were mainly indigenous peoples with additions from the Kopet Dagh region and the possibility, again, of limited northern steppe population incursion. The material remains recovered here so far can be dated as being contemporary with Namazga VI-Iron Age I. But the lowest layers of some other related sites showed occupation and remains from even earlier periods. These were very similar to Namazga IV-V (Kellei Oasis, first period) with wheel-made grey and redware, violin shaped terracotta figurines and spindle whorls. All these features were typical for the villages of this timeframe located within the piedmont strip of the Kopet Dagh. It was during the Namazga V period, (Gonur Oasis, middle phase) that the first traces of northern steppe style hand-made ceramics with potters marks and figurines of crude construction were found in these areas. They confirm the influence and influx of a migration from the north. It was also during this stage that the maximum population was reached in these fortified settlements utilizing full-scale irrigation agriculture based on the new and more sophisticated techniques. Decorated steatite amulets were found in the group of eastern sites located around the Gonur Oasis and on one a winged sitting griffin with its head turned back was depicted while another shows a bird of prey attacking what seems to be a corpse. Also shown on these seals were tree designs and stick figures. The final phase of development at the Togo"lok Oasis area provides evidence for another migration of settlers based on pottery remains and the introduction of the walled fortress city structure similar to those from the Gurgan Plain. The Northern Bactrian plain, located at the intersection of the Amu Darya and its last major tributary the Surkhandarya River, is another recently examined archaeological area of Bronze Age sites. Many sites have been found to show rich remains and sophisticated developments that seem to parallel those of the Murghab. Links between these sites and those of piedmont zone in southern Turkestan have further supported established anthropological evidence for two westward migrations of groups formerly located south of the Caspian Sea. Of major interest here is the site of Sapalli-tepe c.1700-1300BC, where extraordinary soil conditions preserved perishable organic materials including textiles and four burials were found to contain skeletons that had been wrapped in silk garments. The earliest burials were found inside under the floors of living areas, in a style similar to that found in use among far earlier western Neolithic settlements. Of note is that female burials were much richer than those of the males. All ceramics were high quality, thin-walled and wheel made but undecorated. They are very similar to those found at the related Namazga V sites from western Turkestan. Though highly speculative it is possible that the existence of undecorated pottery in these areas may be related to their use of decorative weavings as the medium for displaying culturally important image/symbols. The transition to the Iron Age in Turkestan has again been only recently documented. Archaeological research has shown devolution of material remains and a related breakdown of cultural advancement. The more unified social order of the Late Bronze Age deteriorated and a type of decentralized feudalism replaced it. In the south a new cultural complex appeared c.l000BC and was named after the major site in the Murghab, Yaz. Numerous other similar sites and settlements were scattered from the western Kopet Dagh to the farthest reaches of eastern Turkestan. All exhibit a lack of wheel-made pottery and the re-introduction of hand-made ware, demonstrating the break from the far more highly technologically developed practices of Bronze Age. It has been theorized these rich agricultural oases were occupied by inhabitants formerly from the north. While in the further north on the Missarian Plain, known as the Turkmen Steppe and located east of the Caspian Sea and north of the Gorgan Plain, another culture known as the Ancient Dakhistan Complex c.1500-700?BC has been identified. All the thirty known sites were characterized by a centrally fortified citadel were quite large size, l00acres or more and often included other surrounding small settlements that were spread over an even broader area. With an economy based on stock-breeding and irrigation agriculture, these sites flourished but then in the middle of the first millennium BC were completely abandoned. The cause for this has been linked to the Achaemenian conquest. As an end to this synopsis the cultural developments of the northern steppe, which up to now have been only indirectly mentioned, will be examined. But before dealing with the far north, the Kelteminar Culture south of the Aral Sea and in the Kyzyl Kum should be mentioned. The complex occupation history of the lower region of the Amu Darya was directly related to the extensive course changes it has undergone and also to its constantly changing relationship with the Aral and Caspian Seas. In ancient times it reached the Caspian Sea and contributed to the formation of the lake in the Khoresmian depression, Lake Lyavlyakan. To the east was a delta and to the south another delta, the Akcha Darya delta also existed. In these two areas and parts of the desert areas of the Kyzyl Kum that were formerly fertile and watered by these now dried up water-ways significant finds of settlement areas with archaeological remains have been located. A number of Neolithic open-air sites have been examined and so far nine have proved to have cultural levels. These sites have been grouped together under the label, Kelteminar culture and were centered in the Akcha Darya delta while other related sites in the Kyzyl Kum including those surrounding lake Lyavlyakan and those located farther east in the lower Zeravshan river area have all provided related material finds. At the namesake site for this cultural complex, Djanbas 4 c.6000BC, a large oval hut of wooden posthole construction was found and it is believed to have been used by a non-nuclear family unit. The nearby Lake Lyavlyakan area has proven to have the longest period of occupation beginning in the late Paleolithic as well as the highest concentration of known sites. By c.4000BC turquoise deposits of the Kyzyl Kum mountain range were exploited by these people whose pottery was similar to that of the Jeitun culture and settlements in the south Caspian. Later c.3000BC remains exhibit parallels with those from the northern steppe cultures of western Siberia. The end of this period is associated with finds from the lower Zervshan delta area, where several later sites have yielded architecture and cultural levels c.1700BC which seem to provide an overlap to the succeeding Zamanbaba culture. Until this time period "Nearly all aspects of material culture differ(ed and)...a real cultural divide seems to separate southern from northern Turkmenistan...". (5) The less advanced nature of these sites (almost all are without architecture or any other forms of site development, have no agriculture, and only simple economies) presents many similarities to the lifestyle of the northern steppe nomads. Unfortunately the archaeological investigation of these areas has not been well documented and therefore any conclusions must await further research. However the scarce findings do imply that until the second millennium BC many of these groups developed a more sophisticated cultural tradition, based on hunting and fishing, cereal grain gathering and the simple herding of domesticates, than that of the groups from farther north. The term south Siberia refers to the mountainous area of the Sayan, the Altai and the plains and grassy woodland steppe immediately to their north. To the south these areas are separated from the high plateau of Central Asia by ranges of rugged mountains. It is here in this region that the hordes of war-like steppe nomads pursued their wandering existence, frequently leaving to establish nomadic kingdoms in other locals. To the west, in the steppe areas of western Siberia, sedentary as well as various nomadic peoples are known to have practiced cultural traditions which mixed agriculture and stock-rearing. At some later point it seems that this area was primarily inhabited by the incursion of mounted nomads. In the valleys of the high Altai, abundant archaeological findings provide a useful continuum of occupation beginning with remains of the Paleolithic hunters and gatherers. This sequence continues on through the Neolithic occupation period and ends in the Late Bronze Age when burial mounds came into fashion. Some of these mounds contained considerable caches of material remains that have provided a considerably complete picture of the lifestyle of these early nomads of the Late Bronze Age. The steppe area to the immediate south contained similar remains including those from early sedentary and semi-sedentary stock-breeders and farmers. Farther south and west, the area of Tuva also had a central steppe area where archaeological data shows a long occupation continuum stretching from the Paleolithic to the age of nomads. The similarities in cultural history here and in Central Asia are thought to be the result of their physical proximity. While each of these areas existed more or less as closed communities with unified cultural traditions and developments. But this sense of isolation should not be over emphasized, as there existed a general community of steppe stock-farming peoples spread over a large geographical area, where a synchronicity of cultural developments have been substantiated by archaeological investigation. "The population of southern Siberia went through the same basic stages in the development of culture as the other steppe people, and at the same time. The various advances in domestic economy, weapons, harness and so on did not take long to spread from the Danube to the Yenisey and still farther east." (6). At the end of the third millennium BC, the first phase of Bronze Age culture has been named the Afanasyevskaya Culture after the first three tombs excavated in l920. One settlement site and numerous tombs have been located with finds of pottery, stone, bone, metal objects along with evidence for the use of wood, skin, fur and other perishable materials. These tombs vary in external appearance but have a similar structure with a square pit of approximately 4 square meters and a depth of 1 1/2 meters. They were roofed with a single layer of logs laid closely together in the same direction, above which was placed a mound of earth, sometimes with a facing of stone slabs. The remains from these tombs have enabled a fairly good picture of the life of these people to be determined. They lived a sedentary existence in small settlements of up to ten families. They practiced hunting and fishing, cared for domesticated animals and cultivated crops of edible plants. Little is known of the type of dwellings they utilized during this period or of their decorative art. The simple patterns on their pottery and bone carvings are nothing like the far more complex patterns found farther south. Sometime during the end of the third millennium and the beginning of the second, the homogeneous Europiod population of these northern steppe areas began to show the admixture of Mongo"loid people, probably belonging to groups from even farther north. This trend continued and by the first centuries AD, the entire population was basically Mongo"loid of the Central Asian type. At this time, a new cultural variant, the Okunev Culture made a sudden appearance in some areas and showed a complete break with former cultural traditions. It has been determined from burials that they were Mongo"loid of Central Asian not Northern Siberian type, probably coming out of the forest zone of Siberia. With a more complex assortment of grave goods, it is believed that a higher standard of living had become prevalent and advances in stock-rearing now enabled cattle to be used as draught animals. Along with this increased control over food supply, religious and cult activities also increased. The great quantities of material remains exhibit a higher level of artistic expression substantiating this theory. By the middle of the second millennium this cultural complex was replaced by the Andronovo Culture, which also was to spread into many areas where there had been no traces of the previous Okunev Culture. It seems around this time the pastoral economy changed, this time reverting back once again to semi-nomadism where"...each community after completing the spring work in the fields moved to summer quarters in the mountains or the open steppe, returning in the autumn when the crops are ready for harvest." (8) A move to summer quarters enabled these stock-keeping people to increase the size of their herds and also bought about related changes in social organization and structure. The archaeological remains show that each household manufactured its own pottery, metal objects, spun yarn and domestic objects and like the dwellings used preceding periods, the building of large underground winter houses was continued. For the next 500 years this life-style remained unchanged and the transition to a completely nomadic lifestyle was then undertaken in order to provide new and increased grazing lands for the growing herds. The acquisition of increased lands could only be managed by force and soon large groups, or hordes of nomads became involved in this activity. This war-like nomadic social organization soon forced the settled to adopt a similar mode of existence. This change was completed in a short period of time and completely changed the history of the south Siberian steppe. Now agriculture was almost entirely abandoned and, although individual cultural variants existed, these early nomads all shared common cultural traditions. In the summer transportable dwellings or covered wagons were used along with portable domestic equipment. These groups maintained large herds of cattle and lived almost entirely on a diet of milk and meat. The nomads most important domesticated animal was the horse which was most probably domesticated by peoples living on the South Russian steppe, located from the Don to the Volga Rivers sometime in the fourth millennium BC. Not only was the horse necessary for warfare, but also any large scale grazing of cattle required the swift herding possible only on mounted horseback. In the burial kurgans of the nomads from the Altai, two breeds of horses were found. The first belonged to the standard local steppe variety with heavy bones and large heads, while those buried in the rich tombs of tribal chiefs were tall with aquiline heads, long necks and legs. These were particularly famous in ancient times, fed on corn and well cared for. These burial kurgans have provided a vast assortment of material remains, many of which were imported from outside, but perhaps the most interesting for the purposes of this study is the Pazyryk carpet. The controversy concerning the provenance of this carpet has yet to stimulate any conclusive results and its existence may or may not be proof of a contemporary carpet-weaving industry in Central Asia or the northern steppe. In the other areas of south Siberia, nomadism continued to be the dominant societal form but unlike in the Altai here sedentary peoples continued to exist by building large fortifications to protect their animals, crops and villages. It is believed that eventually a relationship was established between these two antagonistic lifestyles and became economically feasible for both. Such a solution was not always the case and many times the settled villages were finally completely destroyed and the villagers carried of to be kept or sold as slaves. The ensuing history and the eventual nomadic conquest of Central Asia during the very end of the first millennium BC and the beginnings of the first century AD, fall outside the scope of this primarily prehistoric survey and for that reason have not been included. Although there were great manifest changes brought about in south-west Turkestan by the incursion of mounted nomads, many of the cultural principles they brought with them were similar to those of the settled peoples they conquered. The remains of Neolithic and Bronze Age cultural traditions in both societies continued to reinforce themselves as not only a basis for advancement but also and more importantly an indelible tribute to the common evolutionary developmental continuum shared by all cultures and societies.